By easy, I mean EASY. 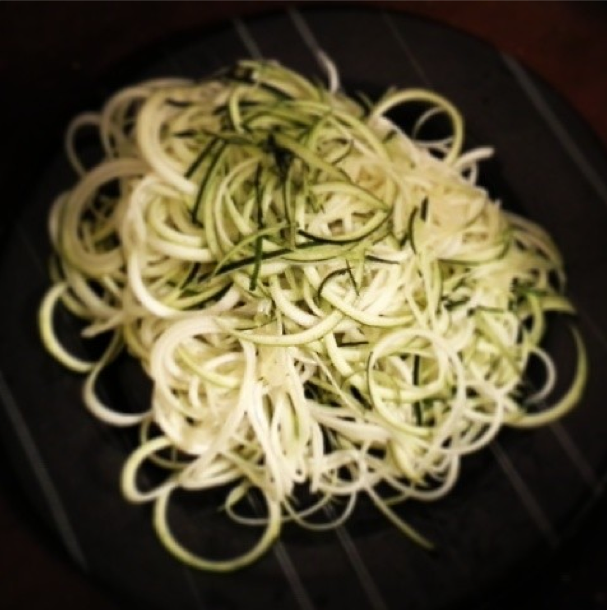 All you need for this to be a success is a Spiralizer…. my favorite new tool, which I got for cheap off Amazon. I LOVE it!! Slice the ends of your zucchini and set aside (or toss in your compost pile!) 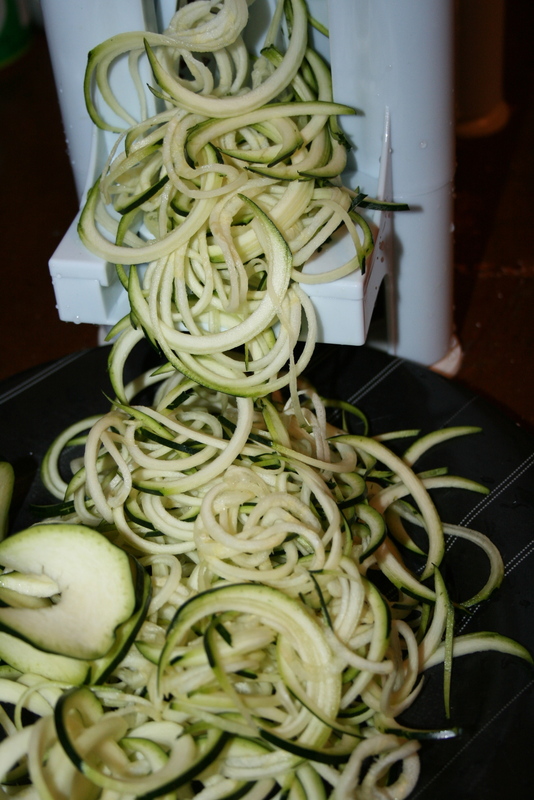 and spiralize the rest! So pretty. Set aside. Warm up both jars/cans tomato sauce and chopped red pepper in a medium pot on your stove at medium heat (or just mix well in a food processor if you want this raw). If you wanted to add onions (which I forgot to do), I’m sure it would be a tasty addition! If so, I would brown them with a tiny bit of olive oil before adding your sauce. You would add your minced garlic cloves at this point too. Add a bit of black pepper and sea salt, but don’t go crazy… you can always add more at the end if you need it. I also added a little water to thin mine out a bit, but this is optional, and depends on how much sauce you need. You could just eat your zucchini raw, which is delicious, but I heated my up a little with the sauce. I just added them directly to the pot and warmed them on medium-low for about 7 minutes. 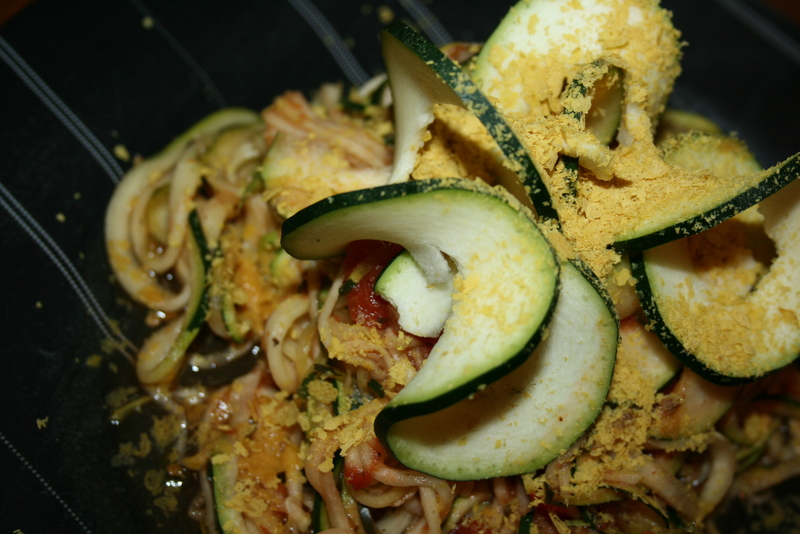 Next, you can plate it, sprinkle on your nutritional yeast (which is a healthy vegan sub for cheese!) add garlic sprole blooms, and enjoy! What’s a garlic sprole? See below. Have you heard of a garlic sprole? 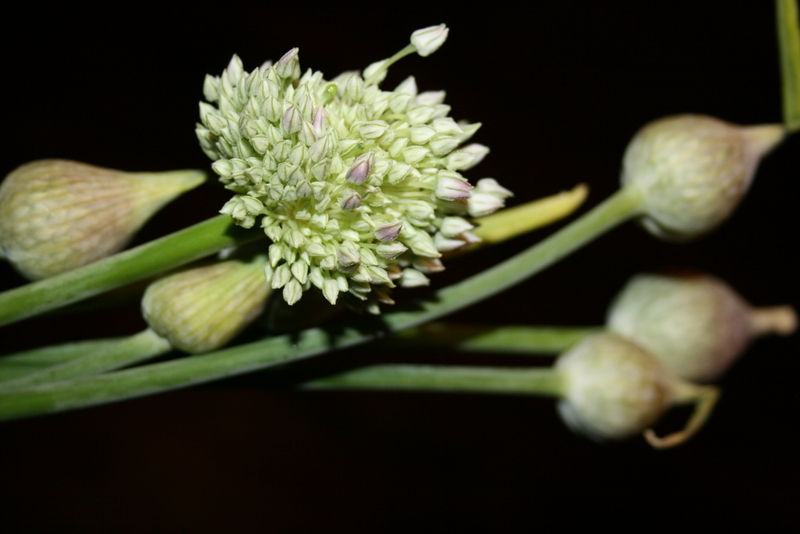 They are the blooms that form at the surface end of a garlic bulb! You can cook with the flowers, and they’re milder and tastier (in my opinion) than garlic cloves! Who knew! We picked these up at the farmer’s market, and I threw a few on top of my spaghetti. So unique and really yummy. They make your dish extra pretty, too! You can store this spaghetti in your fridge, and I imagine it would keep for about a week. But mine would never last that long – it’s SO GOOD! !